October is Breast Cancer Awareness Month, and in honor of this initiative, our three organizations (APEX, Privy Circle, and M8) have teamed up to support the National Asian Breast Cancer Initiative (NABCI), a national not-for-profit initiative that aims to address the unique cultural, linguistic and genetic challenges that Asian women face related to breast cancer. 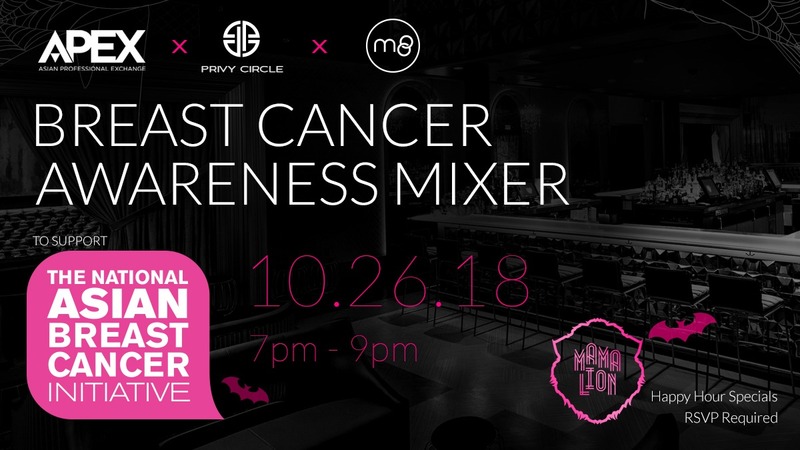 Come out to our NABCI Breast Cancer Awareness Mixer at Mama Lion to network with other young Asian American professionals and support a good cause! A portion of the proceeds from the mixer will go to NABCI. Note: One free drink (beer, wine or well drink) will be included with your ticket purchase. Limited to one pre-sale ticket per person.